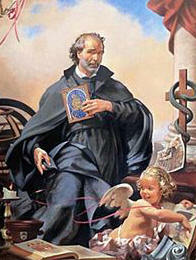 Saint John Leonardi was born in 1541 in Diecimo, in the province of Lucca, Italy. He was the youngest of seven children and was raised in his Catholic faith. His family was industrious and John was the same. Throughout his adolescence, John spent a lot of time working hard in a shop of herbs and medicines that was located in his home town. When he was seventeen years old, his father had enrolled him in a regular course in pharmacy in Lucca with plans for him to be a future pharmacist. John agreed to follow this path and worked very diligently to achieve his goals. After studying for more than a decade, John was able to open his own shop; however he did not think the moment had arrived for him to fulfill a plan that he always had in his heart. After a mature reflection and much prayer, he decided to enter the priesthood. He left his career to be a pharmacist and began taking theological formation courses. On the feast of the Epiphany in 1572, John was ordained a priest and celebrated his first Mass. As a priest, John realized how his passion for pharmaceutics had helped him in his vocation. With his pharmacist background, he was able to help people discover “the medicine of God” which is Jesus Christ crucified and risen, “measure of all things”. He firmly believed that all people needed this medicine and he desired to “start anew from Christ”, as he often said. He spent a lot of time ministering in hospitals and prisons and spreading “the medicine of God” to these people. John knew that the fundamental reason for his existence was his personal relationship with Jesus Christ and because of this conviction; he knew that Christ took primacy over everything in his life. This conviction helped him live out his priestly vocation. John decided to dedicate himself with enthusiasm to the apostolate among youth through the Company of Christian Doctrine. On September 1, 1574, he founded the Congregation of Reformed Priests of the Blessed Virgin, later known as the Order of Clerks Regular of the Mother of God. He encouraged his disciples to have "before the mind's eye only the honor, service and glory of Christ Jesus Crucified," and, like a good pharmacist, accustomed to giving out medicines according to careful measurements, he would add: "Raise your hearts to God a bit more and measure things with him." He chose the Blessed Mother to be the patroness of his order because he had a strong devotion to her. He always kept his gaze on our Lady, and she was his teacher, sister and mother who protected him and led him closer to Jesus Christ. During his priestly life, the Church was under spiritual renewal and many new religious institutes were forming. In May 1605, John sent Pope Paul V a report in which he suggested the criteria for a genuine renewal of the Church. He explained that "whoever wishes to carry out a serious moral and religious reform must make first of all, like a good doctor, a careful diagnosis of the evils that beset the Church so as to be able to prescribe for each of them the most appropriate remedy." He knew what the real medicine was for these spiritual evils and he explained it by saying, "Christ first of all, Christ in the center of the heart, in the center of history and of the cosmos. Humanity needs Christ intensely, because he is our "measure." There is no realm that cannot be touched by his strength; there is no evil that cannot find remedy in him, there is no problem that cannot be solved in him. Either Christ or nothing!" This was John’s prescription for every type of spiritual and social reform. John was also very much concerned with the Christian formation of the people, especially the young. He educated them in the purity of the Christian faith and in holy practices. John spent his entire life working hard to purify the Church and evangelizing the world. His apostolic zeal and all of his evangelization efforts led him to be one of the founders of the College for the Propagation of the Faith. On October 9, 1609, he passed away from influenza in which he contracted while he was giving himself to the care of all those who had been stricken by the epidemic in the Roman quarter of Campitelli. He was venerated for his miracles and religious fervor and was canonized in 1938 by Pope Pius XI.He was chosen as the patron of pharmacists in 2006.